This week, Apple released its first-ever instructions for designing and developing a game controller for use with Apple products. The evidence suggests that Apple is gearing up take gaming beyond the confines of its products. It's going to condone console-style game development. And today's game controller for iOS 7 could mean that tomorrow's Apple TV is a full-on gaming platform. Buried within the new pre-release documentation released this week for iOS 7 and OS X Mavericks is a new "Game Controller Framework". 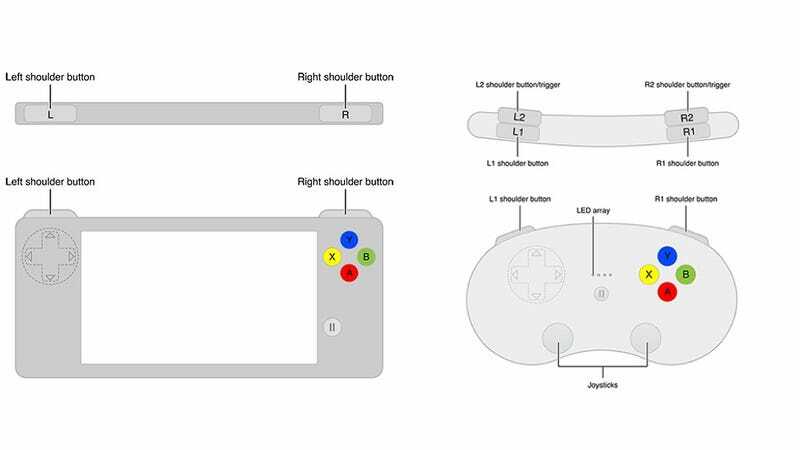 The document, which you'll need a developer account to access, describes reference designs for gamepads as well as a simple API that developers can use to connect the gamepads to one of Apple's operating systems and map the different buttons to game controls. The documentation calls for two different types of controllers. That's them up there at the top of the post. The first is a a formfitting gamepad that connects directly to an Apple product, say an iPhone, leaving the screen visible. The second "extended" gamepad connects wirelessly to a device, say an MacBook, and lets you control what's on the screen. The designs (pictured above) will look familar to anyone who has ever played a video game on a console before. The formfitted one looks like an old Super Nintendo controllers whereas the wireless one looks more like what we're used to on Xbox or Playstation. Both controls have a directional D-pad on the left a standard XYAB array on the right. A pair of left and right shoulder buttons sit on top. The extended controller has a pair of thumb joysticks and an extra pair of buttons on top. Besides defining the method for connecting a controller and receiving inputs from the buttons (or combinations of buttons), the API also specifies an input method for an analog axis control, which could be used to control a gyroscope. A few other ponts of note: Apple says that games must be playable without controllers. Apple also specifies that just because a game uses a controller, it doesn't mean that it couldn't be used in parallel with a device's touchscreen. On the surface, standardizing the design for these controllers might not seem like such a big deal. For years, third-party manufactures have been building unlicensed game controllers for the iPad, and developers have been building games to meet the hardware specs of each product. Because there hasn't been a standard API until now, every kitschy new peripheral built for iPad only works with games built with that hardware maker's protocol in mind. That's a lame experience for consumers not to mention a pretty crappy value proposition. Apple doesn't let screw ups like that fly. So in light of the problem, you can read the move as Apple opening itself up to a new market it can profit from while at the same time standardizing and improving the experience for its customers. Why wouldn't it want to make money every time someone slaps an iPad badge on a box? The answer might have something to do with this: A real, physical gamepad is the missing link between the evolution of Apple's currently lackluster Apple TV, and full-on Cupertino assault on your living room. Indeed, if you've been watching the Apple TV over the last few years, it's hard not to think that it's not living up to its potential. Why no App Store? Why no SDK? The Apple TV currently runs a modified version of iOS 6. Bringing the entire iOS ecosystem over would be a relative piece of cake if Apple wanted to. One of the most compelling explanations for the underdevelopment of the Apple TV is that you wouldn't be able to do much with a full world of apps. Apple's existing Apple TV remote is too stoically minimalist to do much beyond play and pause, and the touch gaming experience doesn't easily transfer to a television without a full-on controller. Being the the user experience obsessives they are, it's easy to imagine that Tim Cook, Jony Ive, et al, weren't going to offer more options for the box until they were sure they could find a way to make it unimpeachably user-friendly, either by building it themselves or by placing strict controls over third parties. At WWDC, we got the latter. There's now a standard. And that's enough for a solid foundation. With control in hand, all Apple needs to do to have a gaming console is to build an Apple TV with guts at least comparable to an iPhone 4S so that it can support all of iOS 7's features. It might not look identical to the little black box we're used to, but it could. It won't happen tomorrow, but it might be closer than we think. Apple supporting game controllers, or especially making them at some point in the future, could mean massive things for gaming. Look at the current landscape: This month, two Android-based game consoles will launch—the Ouya and Nvidia Shield, which cost $100 and $350, respectively. The Ouya's Tegra 3 and Shield's Tegra 4 processors are the same that you'd find in phones and tablets in this generation and the next. They're consoles, built from phone parts, and they're probably the future, in some form or another. They're also probably not something most people want to spend their money on. They're expensive, unitasking portals into mobile games that, by and large, are rather simple. Apple's entry into that same space—presumably through the $100 Apple TV—would change that. Instead of making mobile games the centerpiece of the purchase, they're an added bonus. Apple TV might just be an Apple "hobby," but the company has sold over 13 million units over its lifetime, more than half of those in the past year. That's a sizable existing install base, one for whom games would be an additive feature instead of the only one. And that's the kind of audience that gets developers' attention. The arrival of systems like this for Android or for iOS means we might finally start seeing console-style games arrive on mobile platforms. It's hard to refine controls when you're using touchscreen iPhone controls. The upshot of developing to any platform, like Android or iOS, instead of to specific hardware like an Xbox or 3DS, is that your games will live on, with no worries about backwards compatibility. The downside would be the risk of far more aggressive fragmentation than any gaming console has ever had to deal with. But those are issues for down the line. For now, all that's clear is that Apple has opened the door, even just a crack, to making Apple TV more than a passive watch-box. It's given itself the means to turning a hobby into one of the most compelling buys around.